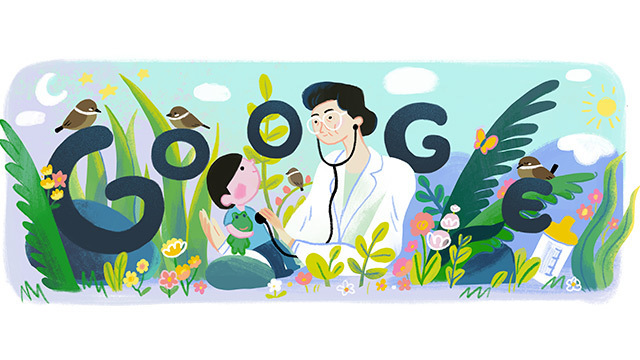 MANILA, Philippines – Google celebrates the 107th birth anniversary of Fe del Mundo by featuring the late Filipina physician in their signature doodle. The doodle, which shows her caring for a child, went live at 12:00 am on Tuesday, November 27. Born in Manila on November 27th in 1911, Del Mundo was inspired to study medicine by her older sister who did not herself live to realize her dream of becoming a doctor. Del Mundo graduated as valedictorian from the University of the Philippines College of Medicine and had her pick of a government scholarship to any institute of her choice. In 1933, she became the first Filipina to be enrolled at the Harvard University Medical School. She was also the first woman to be admitted to the prestigious school. She studied pediatrics until 1936, then enrolled at the Boston University to pursue a master’s degree in bacteriology, which she earned in 1940. She returned to a Philippines gripped by war, so she focused on giving aid to civilians who were affected by the devastations of World War II. After the war, she set her sights on achieving her dream to build her own hospital. The sacrifices she made included selling off her home possessions. In 1957, the Children’s Medical Center was inaugurated. She was one of the first Filipino doctors to look into dengue fever, which was little known in the Philippines at that time. When she wasn’t treating patients, she was teaching students, publishing important research in medical journals, and authoring a definitive Textbook for Pediatrics and Child Care. She also established the Institute of Maternal and Child Health to train doctors and nurses. She was an ardent supporter of reproductive health. Del Mundo was a doctor, a beloved nurturer to children, and a scientist. A true Filipina role model, she lived on the second floor of the Children’s Medical Center in Quezon City, making early morning rounds until she was 99 years old, even in a wheelchair. She was the first woman to be conferred the title National Scientist of the Philippines and received many domestic and foreign awards and honors for her outstanding service to humankind. She died on August 6, 2011. Her remains are buried at the Libingan ng mga Bayani (Heroes’ Cemetery).